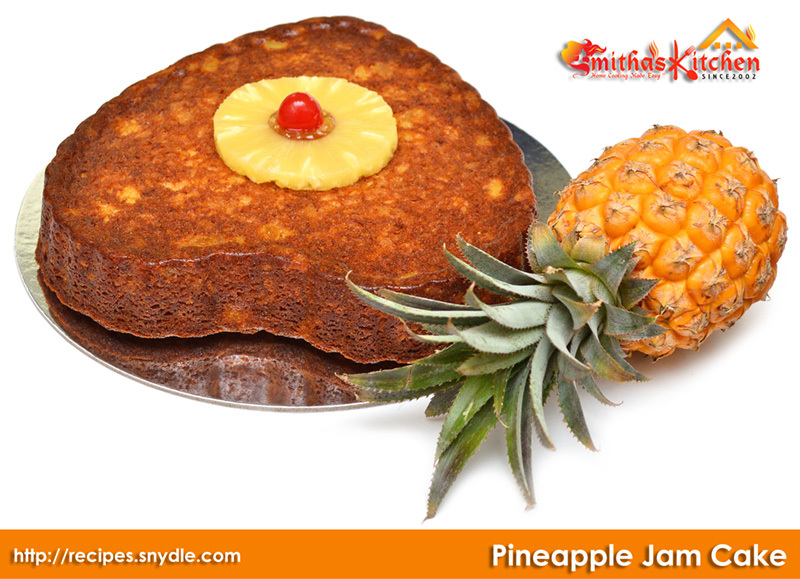 A moist and delicious Pineapple Cake made with Pineapple Jam and a mere handful of fresh Pineapple pieces. This cake is truly delicious than I thought !! Step-1 : Keep ready the 10” Baking Pan lined with the Parchment Paper in it. If the Parchment Paper is not available, we can use butter to grease the Baking Pan immediately before pouring the batter in it. Step-2 : Sift together the All Purpose Flour (Maida), Baking Powder, Baking Soda, Salt and keep aside. This will help the Baking Powder, Baking Soda and the Salt to get mix well with the flour. In a large mixing bowl, mix together the unsalted Butter and powdered Sugar. Add Pineapple Jam, chopped fresh Pineapple, Pineapple Essence and mix well. Add sifted Flour mix little by little and combine well. Step-4 : Switch on the oven to preheat it at 180 Degree Celsius for 10 minutes. Step-5 : Beat all the Egg Whites very well using a hand whisk or an electric whisk until it becomes fluffy and add to the above mix and very gently combine by folding method. Pour the batter into the Baking Pan. Make sure to fill the batter only upto half the depth of the baking pan. Otherwise the batter will overflow when baking. Bake at 180 degree Celsius for first 25 minutes and at 160 degree Celsius for the next 25 minutes. Baking time may vary a little depending on the type of oven and size of oven cavity. Insert a tooth pick exactly in the middle of the cake and the tooth pick comes out clean, we can assure that the cake is perfectly done. Take the baking pan out from the oven, remove the cake from the baking pan and allow cooling it before serving.